I’ll have another croissant please! Seriously, croissants are one of those things that I assumed were impossible to make at home. And without butter? Can anyone do that? Well I did, and to make it even better I filled them with a chocolate almond ganache. 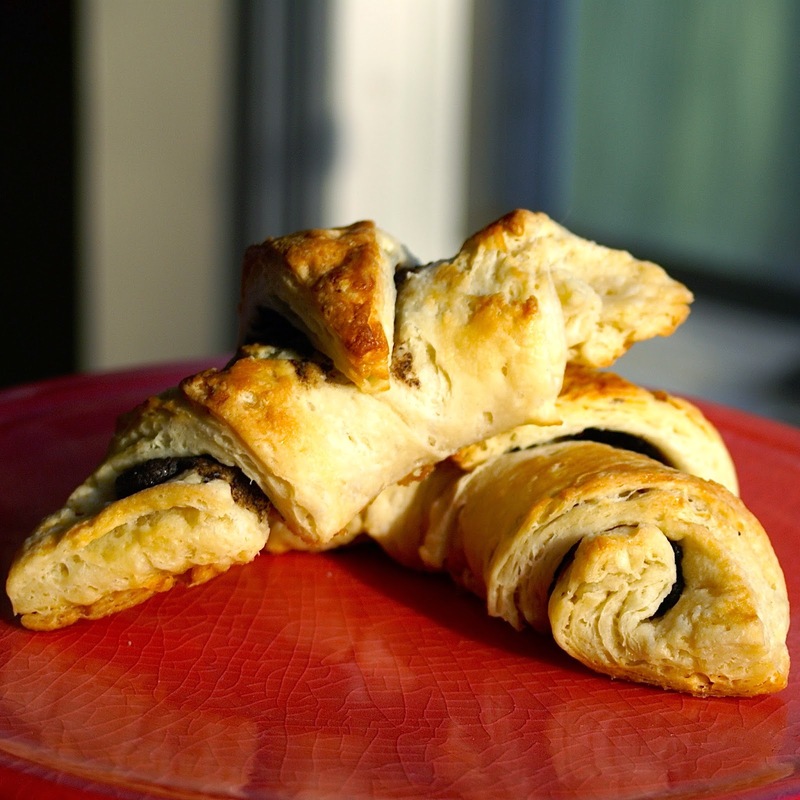 These croissants are light, buttery, and flaky without containing one tablespoon of butter! 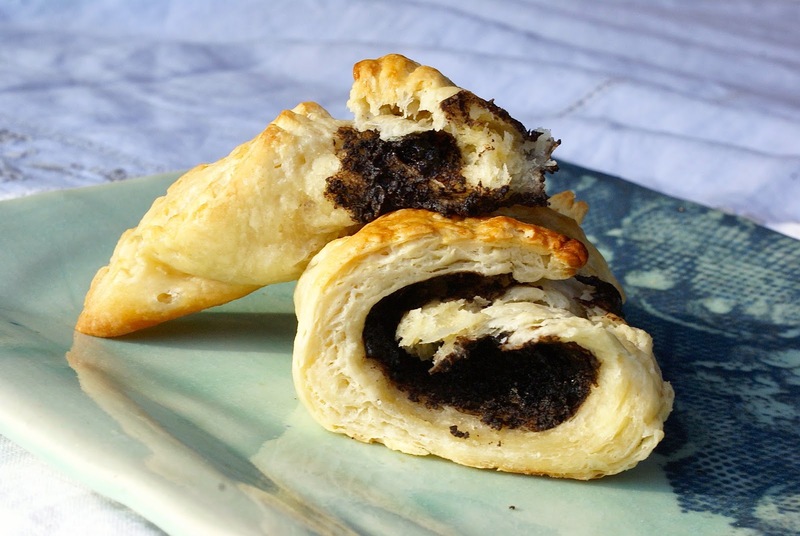 I have searched near and far for a croissant recipe that does not contain butter, or non-dairy butter substitute. Although vegan butters don’t contain dairy, they are highly processed and I like to keep my ingredient list to a minimum. So I got to work in the kitchen with my beloved coconut oil. A lot of stress and many failed attempts later, I finally created the perfect coconut oil croissant. Nick is the reason I tried making croissants in the first place. He loves the chocolate filled croissants you can find at coffee shops so I decided to make my own. 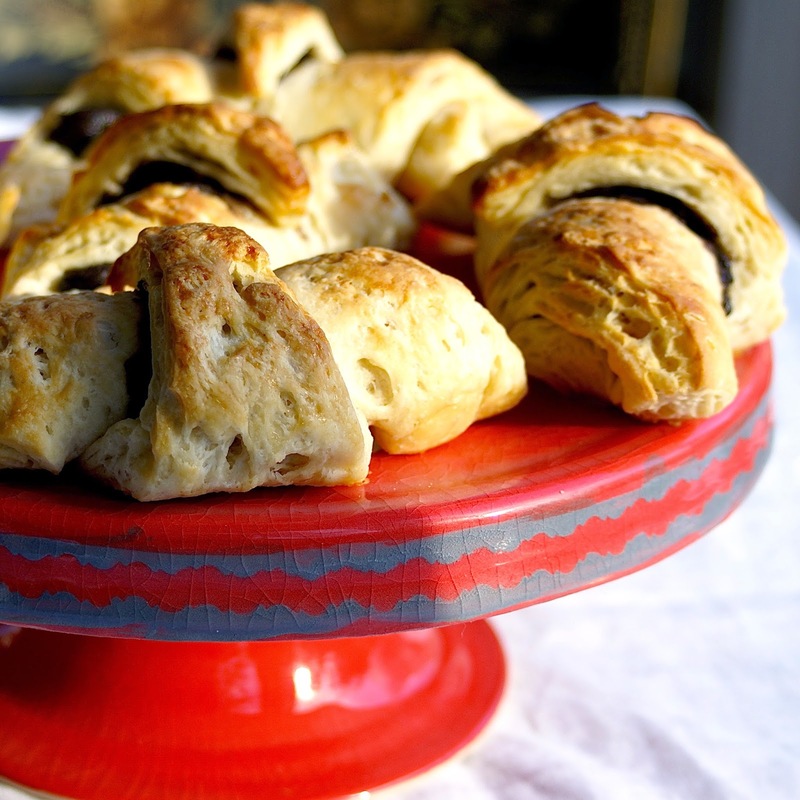 Feel free to can make these croissants without the chocolate filling, however if you like chocolate you must try them with the chocolate almond ganache! It is good enough to eat by itself, and when baked inside the dough it becomes a warm, gooey chocolate burst that melts in your mouth. You can substitute a different filling of your choice, such as apple butter or fig jam. I do need to warn you that making croissants is a lengthy process. Don’t expect to have the finished product within an hour. From start to finish, it takes about 6-7 hours to make these. I usually start them the day before I need them, then finish them the next day. The croissant’s signature flaky layers take a lot of time and work to create, but the beauty of making these is once you start rolling and folding the dough, you can stop and pick up where you left off later. It makes the process seem much more manageable and stops me from going completely crazy! If you ever really want to impress someone or if you just have a undying love for croissants, give these a try! I promise you won’t regret it. When they come out of the oven and you bite into one for the first time, you will understand. 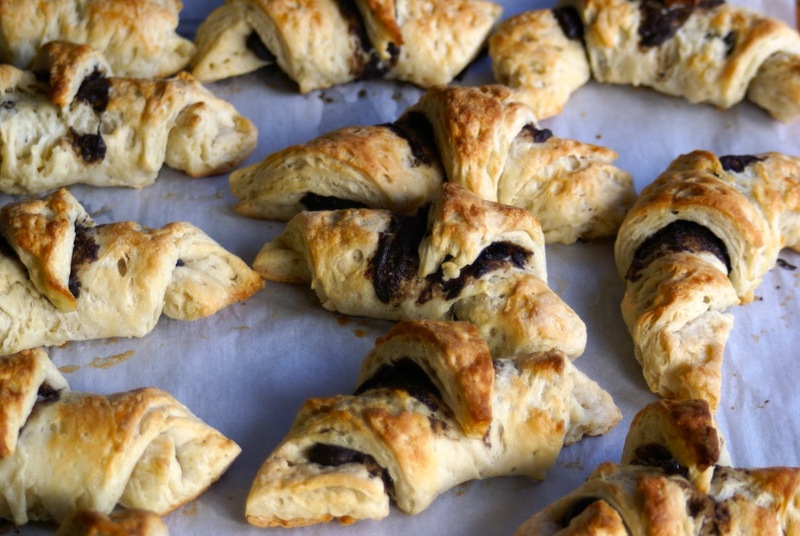 There truly is nothing like a coconut oil croissant right out of the oven…especially when it contains chocolate! 1. Mix warm, sugar, and yeast in a bowl and let sit for 5-10 minutes to proof. 2. If using a kitchen aid: Add flour and salt to the base of a kitchen aid with the dough hook attachment. Mix for a few seconds. Add yeast mixture and oil. Mix for 8-10 minutes, or until a sturdy dough forms. Place dough in a greased bowl, cover with plastic wrap, and let rest in the refrigerator for 2 hours. If mixing by hand: Whisk together flour and salt. 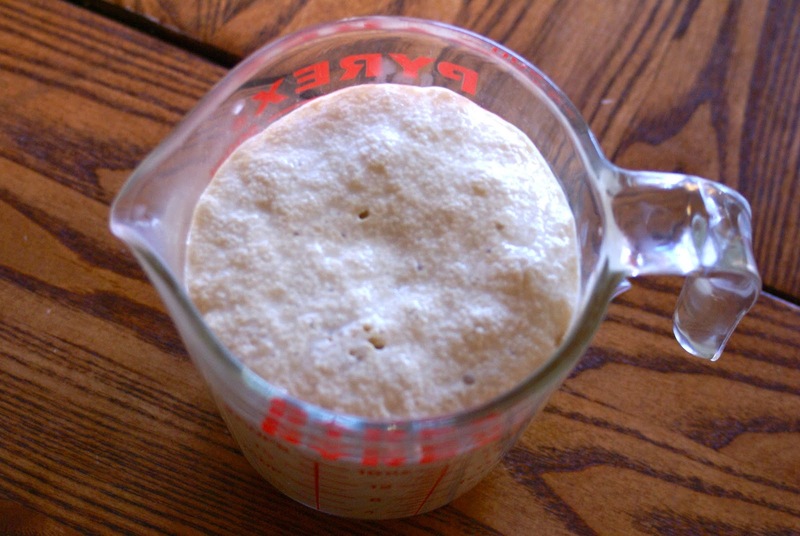 Add yeast mixture and mix until a dough starts to form. Turn dough out onto a lightly floured surface and knead for 8-10 minutes, or until a sturdy dough forms. 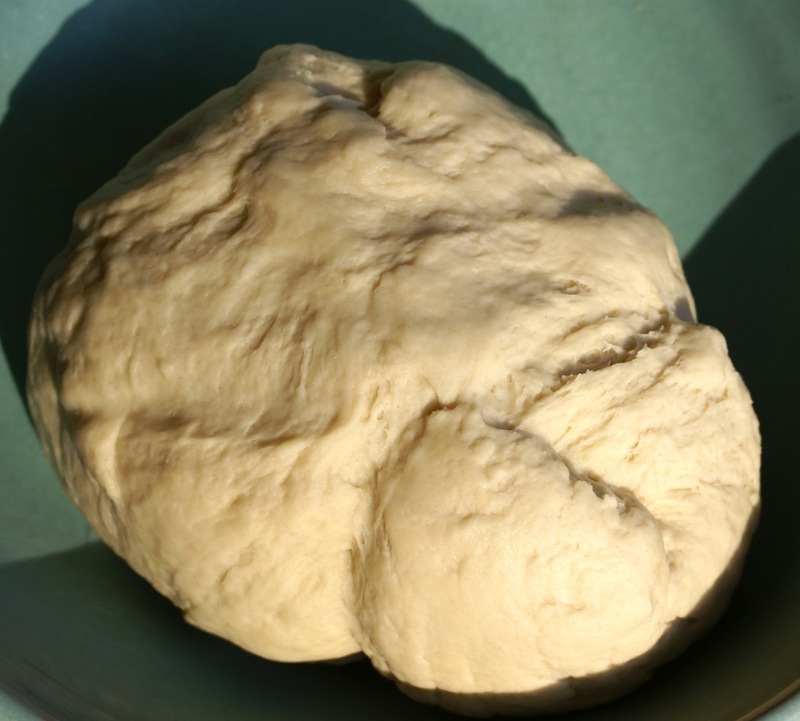 Place dough in a greased bowl, cover with plastic wrap, and let rest in the refrigerator for 2 hours. 1. Line a small baking sheet or cutting board with parchment paper. 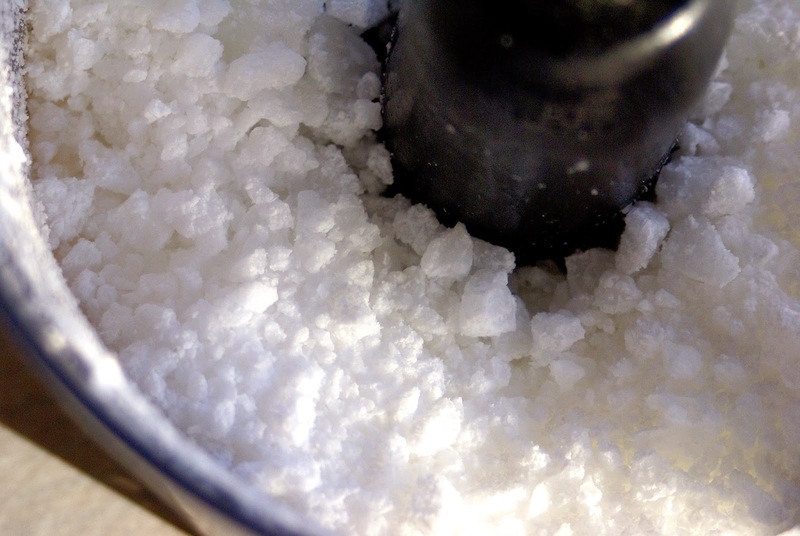 Break apart frozen coconut oil and add to the base of a food processor. Process until the pieces are pea sized. Add the flour and lemon juice and process until incorporated, about 5-7 seconds. Scrape the oil out onto prepared parchment paper and press into a seven inch square. Fold parchment paper over the top of the square and place in the fridge for at least an hour. 1. On a lightly floured surface, press the dough ball into a square shape. 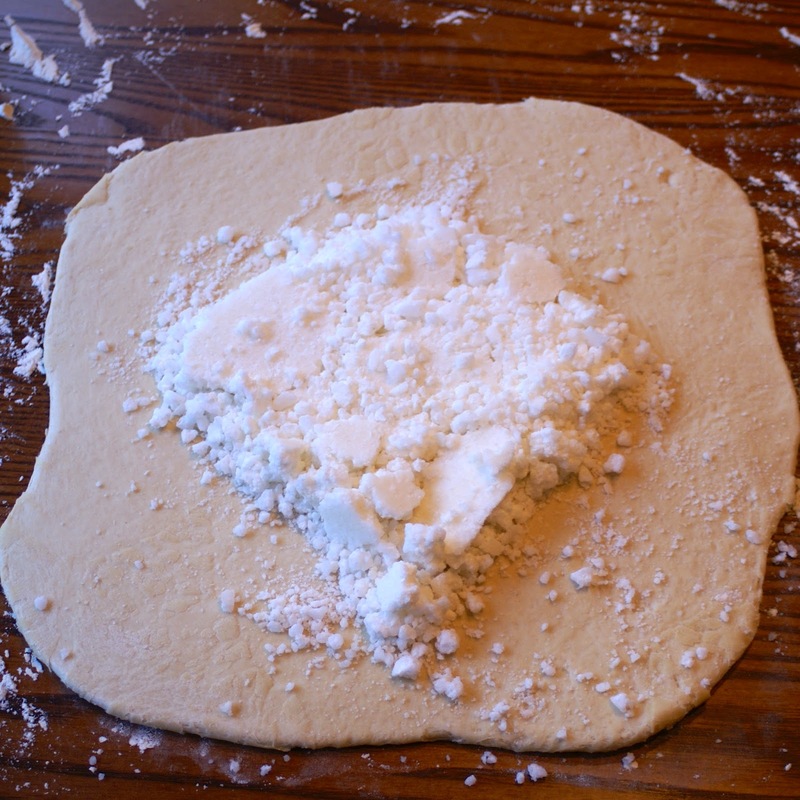 Roll the dough out into a 11 inch square and place the oil square on the dough, at an angle. It doesn’t matter if it is crumbly, just do your best to contain all the oil in the center. 2. 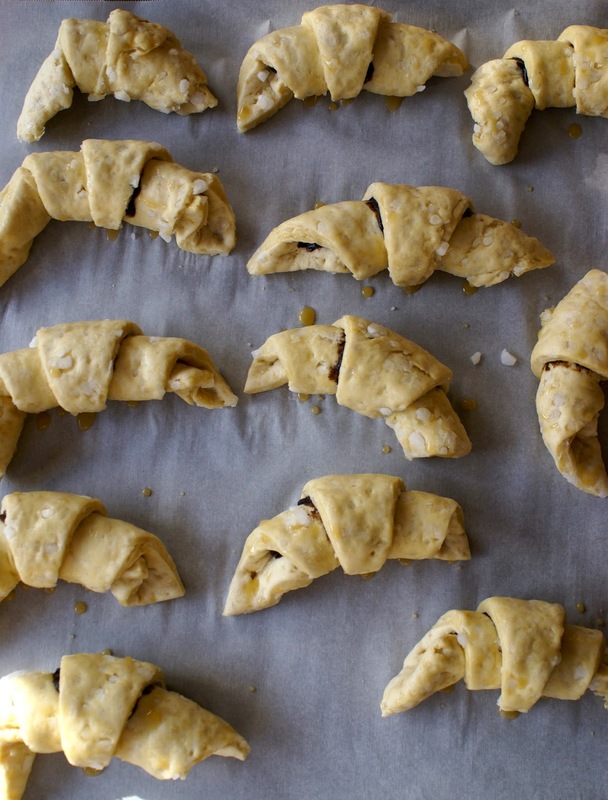 Fold the corners of the dough over the oil and pinch them together so there is no oil showing. 3. Gently roll out the dough so it is an 11 inch square again, adding a dusting of flour as necessary to keep dough from sticking. Then, fold the dough like a letter into three pieces. Repeat the other direction. Wrap in plastic wrap and let sit for at least an hour in the refrigerator. 4. Repeat step 3 three more times. This is a great stopping point if you are starting this process the day before. You can leave the dough, at this stage, in the refrigerator for up to 2 days. 1. Line a baking sheet with parchment paper. Roll dough out into a 18-20 inch square. 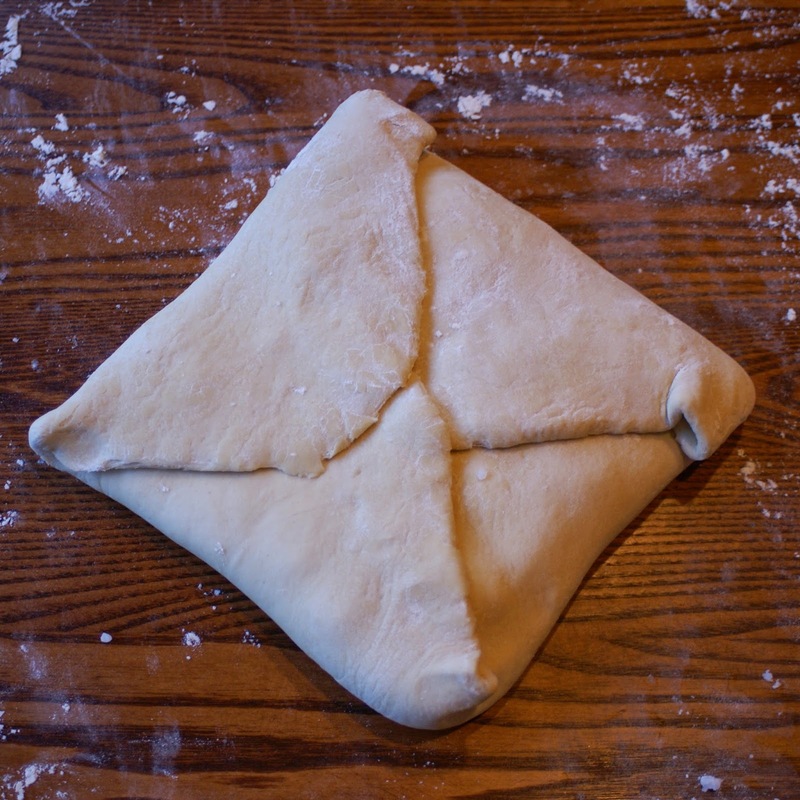 Cut the dough in half vertically, then thirds horizontally making six equal sized rectangles. Cut each rectangle on a diagonal so you have 12 pieces. 2. Cut a 1 inch slit in the middle of the short side of each triangle. Spread the chocolate ganache in the center of the triangle. 3. Fold both sides the two pieces out and roll the dough into a spiral. Curl the ends towards each other to form a crescent and place on prepared pan. 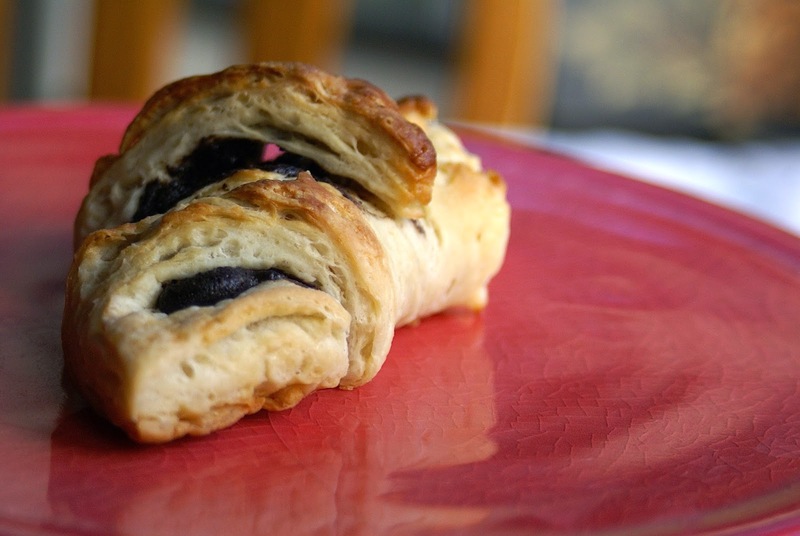 Make sure the tip of the dough is tucked under the bottom of the croissant. Let rest in the fridge for 30 minutes. 4. After 30 minutes, take the dough out of the refrigerator let sit for 10 minutes. Preheat the oven to 400 F. Mix the milk and maple syrup together to brush on the dough. Bake for 15-18 minutes, or until croissants are golden brown. If you are using a flat baking ban, make sure to put a pan in the oven underneath the one the croissants are on to catch oil that might drip off. 5. Eat immediately! Nothing like a warm croissant:) Let the rest cool completely on a wire rack before storing. I have never done that myself so I can't say it will defiantly work. Spelt flour might not rise as well because it is whole grain and there is a lot of kneading involved. I would think that if you added a tablespoon of vital wheat gluten it would be fine (if you can handle that). Otherwise, they will probably taste delicious, just not get as flaky as if you use regular flour. If we are being honest, taste is all that matters! Hope this helps! Do you think I can use coconut sugar instead of brown sugar? And whole wheat flour instead of regular flour? Replacing coconut sugar for brown sugar is fine! 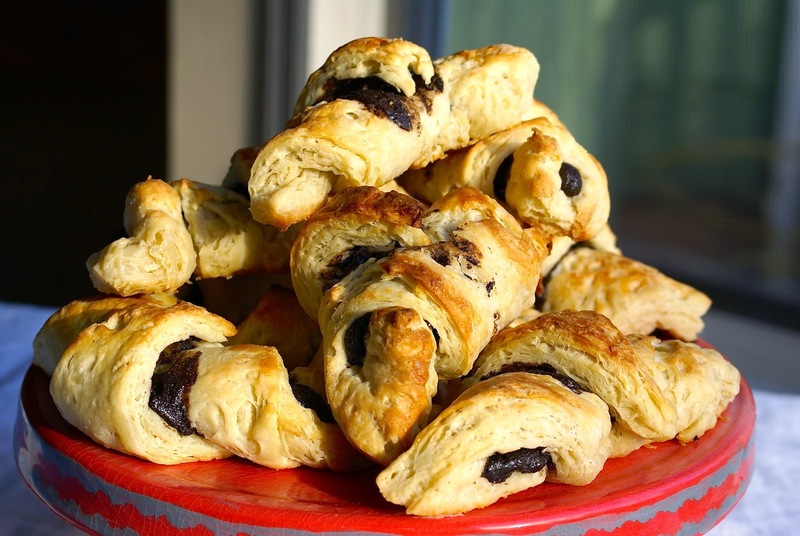 I have never made these with whole wheat flour, I used bread flour because of it's high gluten content. 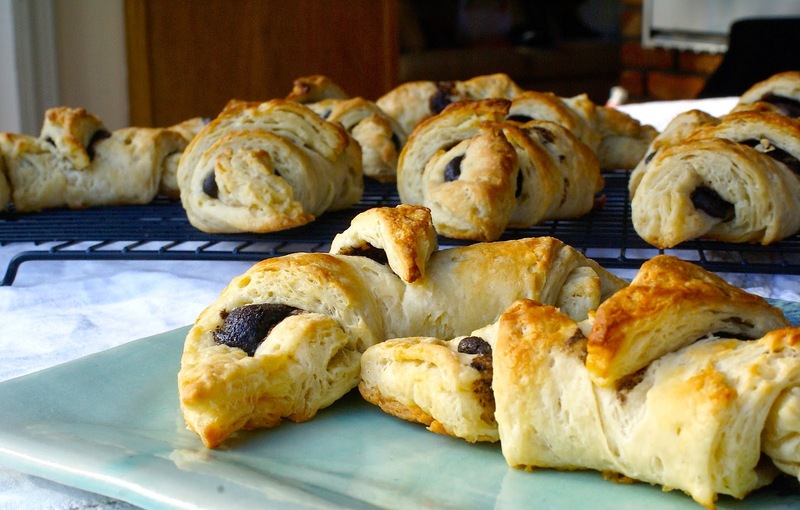 Also whole wheat will make these croissants slightly denser. If you want to try these with whole wheat, use regular ww (not ww pastry) and I would recommend using 1/2 whole wheat, 1/2 bread flour. Also you may need to add a few more teaspoons of liquid because whole wheat flour absorbs more water. Just see how it goes! If you do try these with whole wheat flour, let me know how they come out!! I'm actually in the process of making them now! 🙂 I just used unbleached flour but I did switch out for coconut sugar. Question: if I finish the last roll out and folding vertically and horizontally, can I let the dough sit overnight in the fridge and then roll, cut, and bake it in the morning?